Many of us grow up hearing that “pink is for girls, blue is for boys”—that there are certain ways that girls should dress or act and other ways that boys should dress or act. And we are told that this is how it’s always been. Simple! Or is it? Did you know that the idea that pink is for girls, blue is for boys is a pretty new idea? Historian Jo B. Paoletti* discovered that in the U.S. in the early 1900s it was often the reverse! Blue for girls, pink for boys. No kidding. What does this have to do with our lives today? Everything. It reminds us that what society thinks of as “feminine” or “masculine”—how we understand gender overall—changes over time. And that means it’s important to always question our basic ideas about gender, including gender stereotypes. Gender stereotypes are ideas about how girls and boys, women and men are “supposed” to act, talk, think, and behave. (Back to that old “pink is for girls, blue is for boys” idea.) Researchers have found that kids as young as 3 years old have already absorbed cultural stereotypes about gender. This matters for many reasons, including for your health! Gender stereotypes affect self-esteem (meaning, how good you feel about yourself as a person) and body image (meaning, how good you feel about your body). Messages telling boys and girls that they need to look a certain way (for example, being thin or curvy for girls, or having 6-pack abs for boys) end up making everyone feel worse about themselves—and push some teens to start dangerous weight control or muscle-building behaviors. Gender stereotypes, sexism, and transphobia (that is, prejudice towards transgender people) in school, at home, and in the media are the reason there is so much bullying, discrimination, and violence against transgender and gender nonconforming individuals. These stereotypes can also prevent people from being able to express themselves fully. To be as healthy as possible, everyone needs to be able to be themselves without fear of violence. Gender stereotypes can include the idea that boys/men should not show emotions or ask for help. This leads some boys and men to avoid going to see a health care provider, even though regular check-ups are important for taking care of your body now and preventing future health problems. These are just a few of many possible ways. 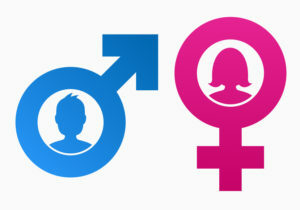 Can you think of some other ways that gender stereotypes might be bad for health? Awareness is the first step. “Rules” about being a “real man” or “real woman” are all around us—and reinforced by multi-billion dollar businesses that want to sell us products to make us feel more beautiful, more buff, more feminine, more masculine. But just being aware of these messages, discussing them with your friends—and asking questions about who is making money from them—is a great first step. Take a look around you. Are there things your school (or community) can do to break down gender stereotypes and support all gender identities and gender expressions? Here are some resources to get started! * See Jo B. Paoletti’s book, Pink and Blue: Telling the Boys from the Girls in America (2012) for more on this and for interesting early 20th century photos of boys in skirts and girls in rompers.